Most consumer electronics vendors have tried their hand at an Android tablet, many of them unsuccessfully. While LG globally launched the 3D-capable Optimus Pad back in 2011 (with little fanfare), the G Pad 8.3 marks the first time the company has released an Android tablet in Australia. The G Pad 8.3, as its name suggests, has an 8.3in IPS touchscreen. LG says the aspect ratio of 16:10 means the screen is better suited to movie playback and entertainment than many smaller tablets on the market. Further, it claims the small side bezel (7.2mm) maximises screen width and makes the tablet more comfortable to hold. The LG G Pad 8.3 has an 8in IPS display. The G Pad 8.3's display has a resolution of 1920x1200 pixels, which gives it a pixel density of 273ppi. That puts it on par with Google's latest Nexus 7, and well ahead of Samsung's Galaxy Tab 3 8.0, which appears to be LG's prime target. However, the G Pad can't quite mate the 2048x1536 resolution of Apple's new iPad mini. 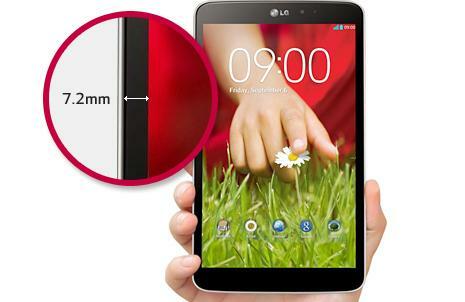 Weighing 338g and measuring 8.3mm thick, the LG G Pad 8.3 is comparable in size and weight to most of its competitors. It has a plastic body but LG has used an aluminium panel on the back, which gives it a two-tone look. Australian models are only available in white. The LG G Pad 8.3 is powered by a 1.7GHz, quad-core Snapdragon 600 processor, has 2GB of RAM and comes with 16GB of storage. A microSD card slot is included for users to expand the on-board memory. The G Pad 8.3 is a Wi-Fi only tablet, so there's no 3G or 4G models available. 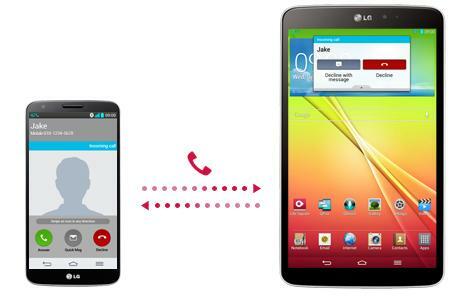 The LG G Pad 8.3 runs the 4.2 Jelly Bean version of Google's Android operating system, but like the G2 smartphone, LG has skinned the interface with a number of its own features. The most notable in this case is QPair, which links the tablet to any Android smartphone via Bluetooth and an LG app. It allows users to receive call and message notifications on the G Pad 8.3, including the ability to reply to messages directly from the tablet. Q Pair also enables immediate activation of the wireless tethering feature, and has a feature called "recent app sticker" which displays a small notification of the last used app on the tablet when you switch to the phone, and vice versa. It's a feature that sounds good on paper but while it allows users to open that app, it won't open it to the exact location you were on the other device. QPair links the G Pad 8.3 to any Android smartphone via Bluetooth and an LG app. The G Pad 8.3 also borrows a feature called "knock on" from the G2. It allows users to unlock the screen when you double-tap it quickly, and locks it again when you double-tap the status bar or an empty area on the home or lock screens. We can only hope LG's implementation has improved since the G2, as we found it doesn't work every time. The G Pad 8.3 will be sold exclusively through JB Hi-Fi and will stay as a retail exclusive until early 2014, a period of approximately three months.